Hi everyone! I'm super excited to share with you Lynnderella's newest collection- Talismans and Birthstones! Amethyst Devotion contains assorted shades and shapes of purple and lavender glitter accented with red and magenta in a multi-shimmered clear base. 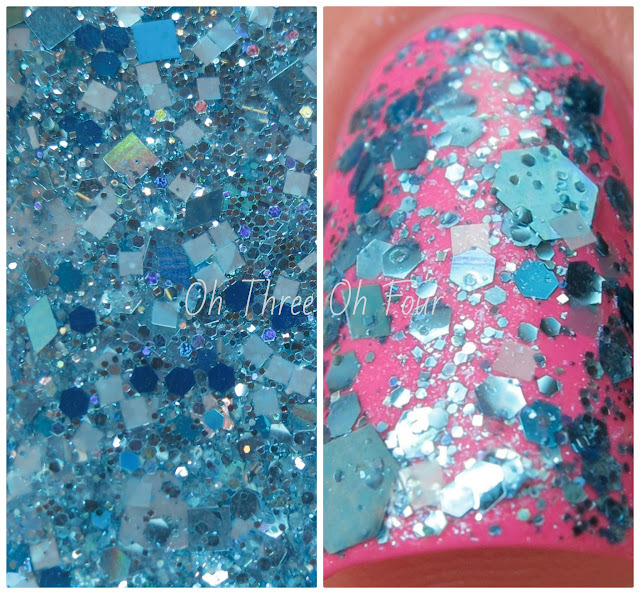 Devotion All nails are 1 coat over 3 coats of Sinful Colors Genteel with top coat. 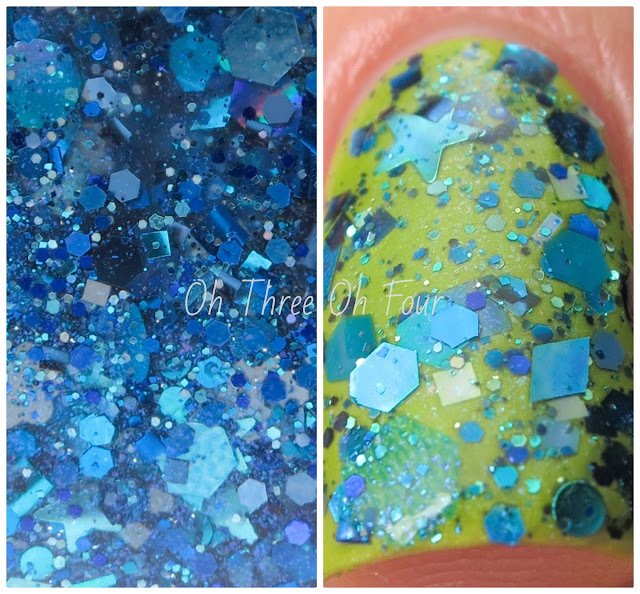 Aquamarine Calm has a variety of light cyan glitters highlighted with a sprinkle of pure cyan and scattered tiny holographic silver stars in a turquoise-shimmered clear base. 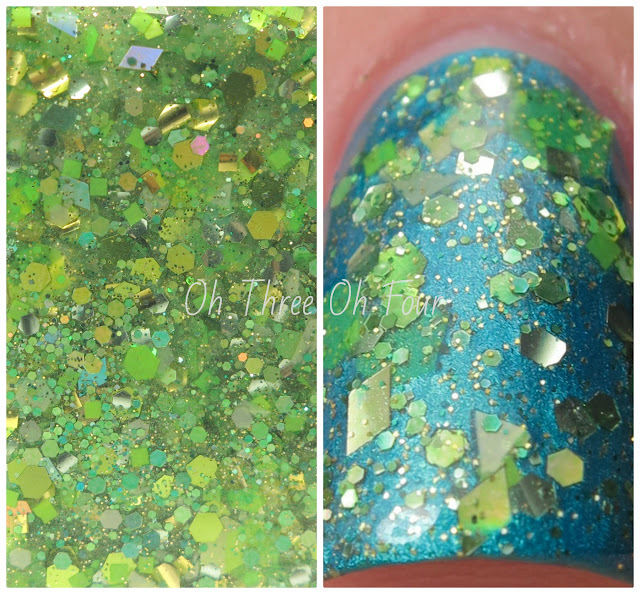 Shown is 2 coats of Aquamarine Calm over 3 coats of China Glaze You Drive Me Coconuts with top coat. Diamond Light is made with silver and pink dots and diamonds dusted with assorted microglitters in a clear base. For these photos I used 2 coats of Diamond Light over 3 coats of Cosmetic Arts Gray with top coat. Emerald Hope is a green multiglitter in a clear base. Here I used 2 coats of Pure Ice Electric! and 2 coats of Emerald Hope with top coat. 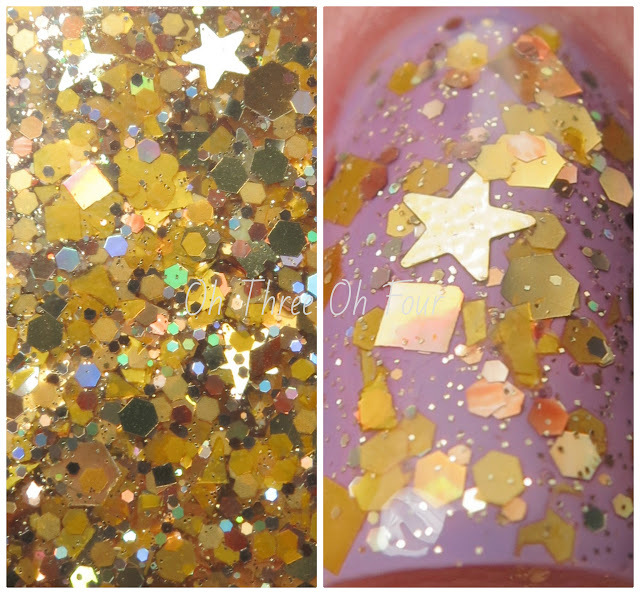 Garnet Grace is a dense mix of red, burgundy and purple accented with green and orange microglitter in a clear base. All nails are 3 coats of Garnet Grace over bare nail with top coat. Karma Carnelian has a mix of reds and oranges in a shimmering translucent red-orange base. 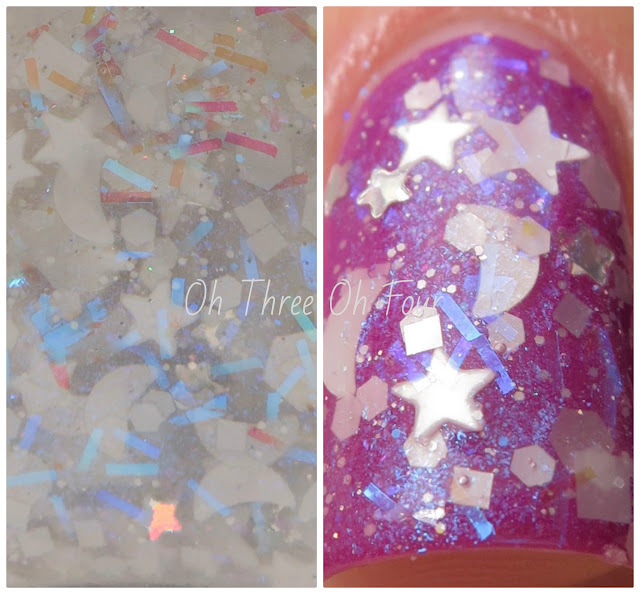 For these photos I used 2 coats over 2 coats of an unnamed light purple by L.A. Girl (from their Polka Dot set) with top coat. Moonstone Magic is full of white moons and stars, assorted white shapes, various blue iridescents, tiny holographic silver stars and rainbow dust in an intense blue-shimmered clear base. Here is 2 coats over 2 coats of Studio M Thunderbolt with top coat. 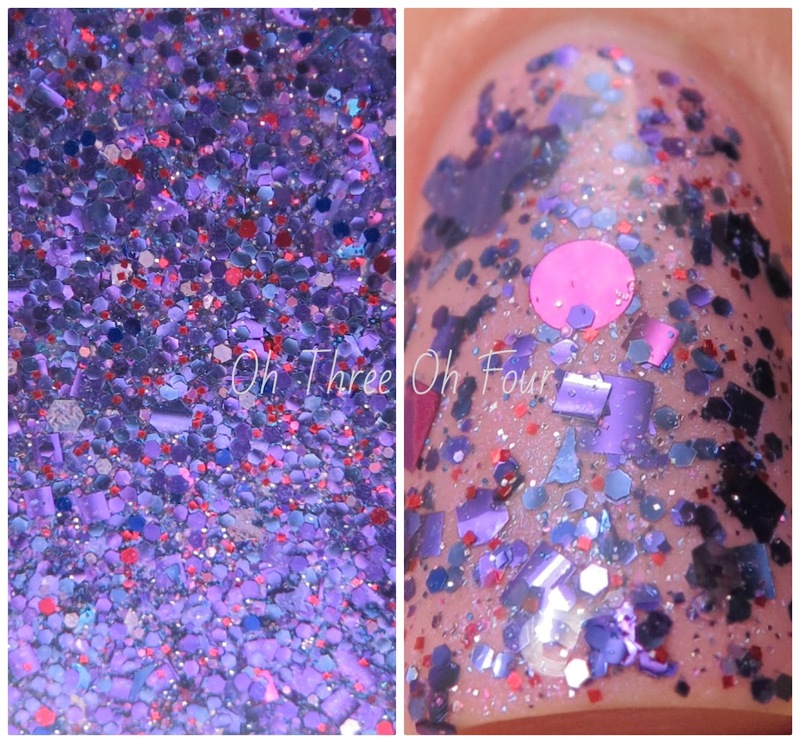 Opal Intuition contains blue, green and orange iridescent glitters accented with neon pink and lilac holographic microglitter in a blue-shimmered clear base. All nails are 2 coats of Opal Intuition over 2 coats of Pure Ice Castle of Dreams with top coat. Peridot Power has contains translucent neon yellow and lime hexagons as well as chartreuse glitters accented with microglitters in a clear base. Shown is 2 coats of Pure Ice On His Saddle with 2 coats of Peridot Power and top coat. Ruby Passion is made with magenta, red, purple and rose glitters in a pink-shimmered clear base. All nails are 2 coats of OPI Candlelight with 1 coat of Ruby Passion and top coat. Sapphire Starfire is a dense blue multiglitter in a strong blue-shimmered clear base. I started with 2 coats of Illamasqua Radium and used 1 coat of Sapphire Starfire with top coat. Tanzanite Truth has blue violet, purple and blue glitters in a multi-shimmered clear base. Shown is 1 coat of Tanzanite Truth over 1 coat of Nails Inc. Hampstead Gardens with top coat. Topaz Optimism contains assorted golds and satin yellow glitters in a clear base. All nails are 2 coats of L'Oreal Royalty Reinvented with 2 coat of Topaz Optimism and top coat. I can't be the only one to look at this collection and think how much fun it would be to do family member's birthstones together. ;) Here is my small family's stones combined! Aquamarine Calm (my son's birthstone and reason for my blog name), Tanzanite Truth (my husband's birthstone) and Peridot Power (my birthstone). This new collection will be available today on Lynnderella.com! And soon on Norway Nails! Make sure to follow all the Lynnderella fan pages on Facebook, Twitter, Instagram, Pinterest and Tumblr! Also be sure to check out Atlcatsmeow on Facebook and Instagram for more swatches and comparison photos! 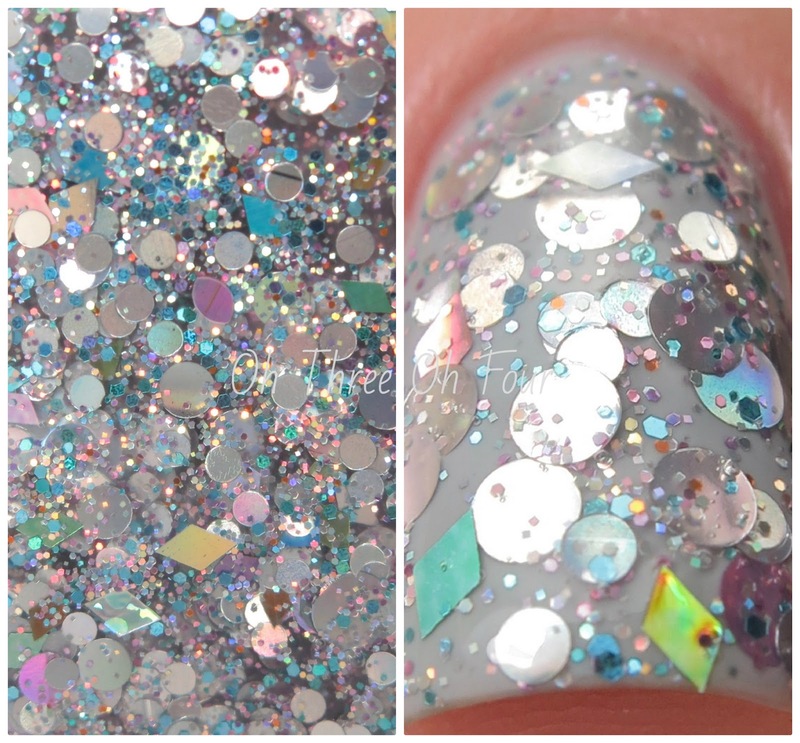 Labels: China Glaze, Cosmetic Arts, Illamasqua, L.A. Girl, L'Oreal, Nails Inc., OPI, Pure Ice, Sinful Colors, Studio M.